Dailybuzz.ch: Iggy Azalea, Britney Spears, Katy Perry, Wiz Khalifa, Ariana Grande, Pitbull, Sia Read 'Mean Tweets'! Iggy Azalea, Britney Spears, Katy Perry, Wiz Khalifa, Ariana Grande, Pitbull, Sia Read 'Mean Tweets'! You must have thick skin to appear on Jimmy Kimmel Live's wildly popular "Mean Tweets" segment. In the second music edition, Ariana Grande, Britney Spears, Drake, Katy Perry, and Lady Gaga are among the entertainers to read unfriendly messages posted about them on Twitter but can they handle it? The tweets only get meaner. "A Lady Gaga fragrance? Bet it smells like d**k." Lady Gaga recites. 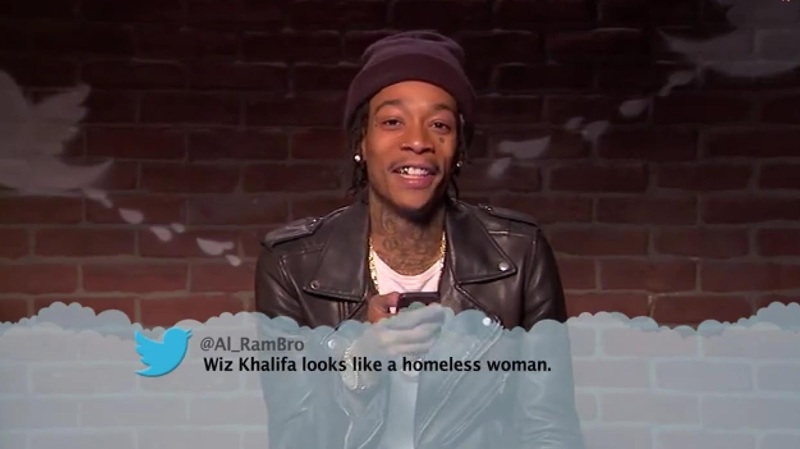 Wiz Khalifa didn't get off easy either with his mean tweet. "Wiz Khalifa looks like a homeless woman," the rapper reads.